Here at The Dirt Bag, we welcome Utah’s sod season like the Whos welcome Christmas to Whoville (minus the strange instruments, of course). Each year, when mid-March approaches, we clear out a big space at our West Jordan headquarters and wait in breathless anticipation for the turf to arrive. Yes, you might say we get awfully excited about Kentucky Bluegrass around here. And so should you! Today, your lawn probably looks a bit grim. But – good news! – tomorrow it can look like the 8th green at Victory Ranch. All you need is a delivery of high-quality sod. We’re actually pretty tired of hearing about this turf war (see what we did there? ), because sod offers a myriad of advantages over grass seed. Sure, you can plant grass seed and mulch and fertilize, then water water water until you’re blue in the face. Next, you wait and watch while the birds eat all your precious grass seed. Two weeks later, you may see a few blades poking up here and there, but you can’t walk on it yet. Two months from now, you’ll still have bare patches and weeds, and you’ll spend the rest of the summer playing catch-up. Now, doesn’t an insta-lawn sound better? The Best Time to Plant Sod in Northern Utah is NOW! It’s time, right now, to prepare for your sod installation. This means you need to aerate, add your soil amendments, mulch and fertilize. Give your sprinkler system a quick tune-up too, and make your adjustments now to avoid dry spots. The less time you spend trampling on the newly spread sod, the happier it will be. Remember to water as you’re laying the sod, making sure the soil is moist (not saturated) to about 8 inches deep. Don’t forget to water it correctly once it’s down, for a trouble-free summer of lush, healthy turf. 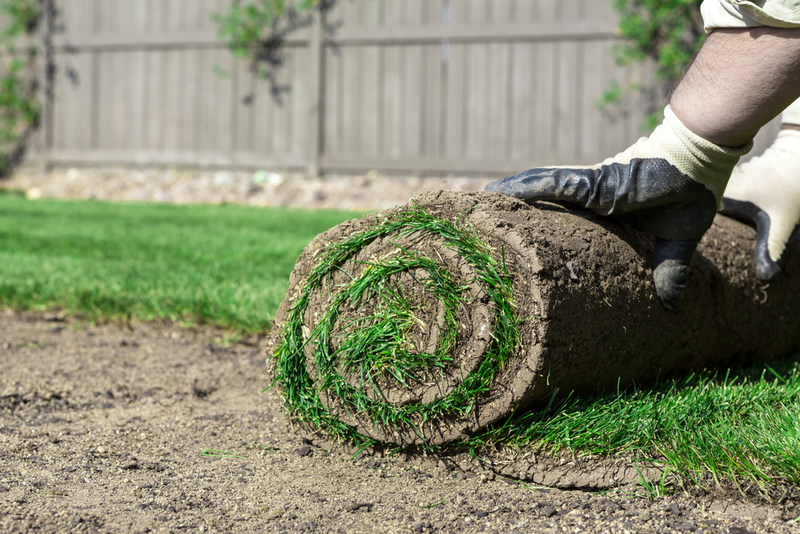 Keep your sod moist – but not soggy – for two solid weeks after it goes down. Gradually reduce the frequency of your watering until you’re watering thoroughly only once or twice a week. Assuming you do all the right things with the mower and the fertilizer, you’re set for the summer. All of our sod is designed specifically to thrive in our northern Utah climate, and we have all the best cultivars. This means that our Kentucky Bluegrass sod is the lushest, greenest and healthiest you’ll find. Oh, and it’s specifically chosen for its low water requirements. The Dirt Bag delivers organic garden soil, compost, mulch, play sand, decorative rock and more throughout Salt Lake County. Or, you’re always welcome to come to us in West Jordan, and we’ll load you up! Contact us today and we’ll deliver your sod fresh from the farm, or stop by our place and pick it up. Remember, The Dirt Bag is your premier locally owned and operated provider of the finest Utah sod.